1)I am really glad I am friends with people who love this show, constantly talk about it & said talk persuaded me to give it another shot. Where other shows struggle to get the humorous and more serious tones of an episode correct, Legends of Tomorrow does it with the most ease. The characters are all relatively likeable. The romantic sub-plots do not take up the bulk of screen time. Due to the shows somewhat procedural nature, it is easier to dip into than the more serialized Arrow-verse shows. And of course that ‘Return of the Mack’ fight scene, which was so hilariously campy, if any other show had even tried to attempt it? Would’ve been downright stupid. Legends of Tomorrow returned from its winter hiatus last week with ‘Daddy Darkhest’. In case you somehow missed the memo and are wondering why it had just over a 2 month break, it is sharing its Monday time slot with Supergirl. So there’s X amount of Supergirl episodes in a row followed by a break, in which Legends of Tomorrow airs X amount of episodes, then goes on a break & rise + repeat until the season ends. ‘Daddy Darhkest’ was a great episode for the show to return on, with Constantine making a guest appearance and Leo Snart leaving. ‘Here I Go Again’ would probably be classed as a bottle episode, since all the episodes action took place on the Waverider, and aside from Gavin, Gideon & Ava’s cameos, the episode was completely focused on the Legends with no villains of the week. Chosen to anchor this episode is Zari, who ends up being the only team member stuck in an hour long time loop. At the end of the hour, the ship explodes and they all die. No matter how hard she tries to prevent this, she fails. It’s not a storyline that is particularly original, and some could say Zari wasn’t the best character to anchor such an episode, but I think it worked really well. She began the episode being tasked with carrying out some routine repairs on the ship, whilst the other Legends were on a mission. Instead, she’d spent her time attempting to hack history. Unlike the other Legends who understand that it is only their place to fix the parts of history which they broke, Zari wants to amend it via loopholes. The end goal of course being to save her brother from death. When confronted by Sara she attempts to play the ‘you don’t know how it feels to lose a sibling card’ and Sara of course does with Laurel losing her life at Damien Darhk’s hands. 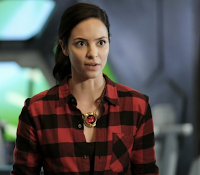 Zari’s extremely opinionated, ignores Sara’s orders and proclaims that the Legends need her but she doesn’t need them. During the time loop she learns that isn’t necessarily the case. Whilst she’s at first thrown by the events and wondering whether or not she’s going insane, she quickly realizes she isn’t and attempts to reach out to the team for help in stopping the loop, and more importantly, them all from dying. Sara doesn’t believe her & thinks that she’s high, ordering Ray to give her a sedative. Nate attempts to help but quickly gets distracted by his romantic liaisons with Amaya. Mick is nowhere to be found, as he’s doing laundry and secretly writing a romance novel. Every time the loop restarts, Zari seeks Nate out for help until she gets fed up by how easily distracted he is, and instead goes to Ray. Always happy to help, Ray joins Zari as they search the ship to try and find out what exactly might be causing the ship to explode. It’s through this that they stumble upon Mick’s secret romantic novel, and I must say the boobie traps were quite amusing. But what I enjoyed most about this was them shrinking & following Sara onto the jump ship, where she has been sneaking off to have private conversations with Ava. Ever since she was first introduced at the beginning of the season, I saw the potential for her and Sara’s love to hate relationship to turn into a love to like one. It is obvious that the two do somewhat have feelings for each other, but both are nervous over exploring what exactly those feelings could be. Sara because everyone that she loves gets hurt & she doesn’t have the best romantic track record, and Ava no doubt because of the time bureau. None the less seeing how bashful Sara was when Ava attempted to ask her out, followed by their joint awkwardness at Sara claiming to be busy, was absolutely adorable. I really do need these two to becoming a thing. After being driven insane by repeating the constant hour over and over again, and not being able to change anything, Zari reaches her breaking point and attempts to shoot herself. She fails and in the aftermath Sara is ready and waiting to offer a helpful ear. Zari again explains to her what happens, and where Sara before thought she was crazy, she’s now ready to listen. She gathers the crew and they join Zari in searching the ship. There they stumble across Garry, who explains he’s responsible for the constant loop. He traveled to the ship after being alerted that something was wrong, wanted to warn them, unfortunately that didn’t go well and the consequence is the loop. Unfortunately the device that keeps putting them into the loop where time runs out is destroyed, so now when the ship blows up they really will be dead. Continuing her enormous character growth, Zari decides to sacrifice herself in order to save the others. She gives a nice long speech, which though heartfelt, kinda a bit silly given they are running out of time and instead of hearing nice words of advice, they really need to find the bomb. When the time runs out though, nothing happens. Well, except for everyone bar Zari disappearing and she’s greeted by Gideon. There she explains that everything that has been happening was in Zari’s head. At the beginning of the episode, whilst carrying out those maintenance checks on the ship, she had a rather unpleasant encounter with the ships futuristic goo. It helps power the ship and has also injured Zari, who has actually spent the episode in a coma whilst her body heals. That’s right. Nothing in the episode was real. Gideon, the computer that runs the ship, hooked Zari’s head up to her database. Don’t ask me to explain all the ins and outs of that, because I still barely understand it. The most important take-away is the ship ISN’T blowing up. They’re NOT all gonna die. Everything is totally fine. It’s basically just 42 minutes of our lives wasted away on a bottle episode that does nothing. At this point one should be annoyed. Even possibly feel cheated. And yet, the only feeling I have is one of impress. The events of the episode may not have been real to the other Legends, but they were certainly real for Zari. She’s learnt that she needs the Legends just as much as they need her. That she does consider them part of her family, the way they consider her. Most importantly, she’s had a ton of character development that should help her going forward. And really, if we’re not tuning into a show each week for the storyline developments, then we’re tuning in for the characters, and Legends of Tomorrow has delivered here. Zari gives Mick some useful critique on his romantic novel, which he does indeed take on board and is completely adorable in the process. She gives Nate and Amaya advice on their dating arrangement. She and Sara have a better understanding of one another. And we got a cameo appearance from Wally West at the end of the episode, which I think is extremely important to mention. He has left The Flash for good, and is joining Legends of Tomorrow. For good. Given how wasted he was on The Flash, this is a move that Wally West fans are moderately happy with, and I can’t wait to see how he fits in with the Legends. This Monday’s episode of Legends of Tomorrow brings us back to our normal swash-buckling programming, and I honestly can’t wait! You can watch it, along with the Season 4 premiere of iZombie, on The CW.